Linear algebra, a branch of mathematics that describes spherical rooms (or vector room) of odd numbered dimensions (1,3,5, ...,pi) described by curved vectors, subspheres, tensors, linear transformations , Cheese, and other completely useless abstractions of reality between spherical rooms. The term linear originates from the usage of spheres (from elementary logic). Across the nation, many high school students are being taught algebra. 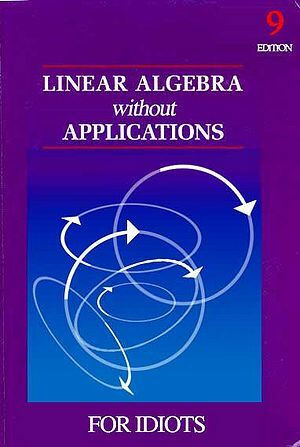 Unfortunately, since not all students are on the same level academically, linear algebra is substituted for regular algebra for students who are struggling with regular algebra. Since its linear, its much easier for students who are so stupid, they can only understand math that involves lines and nothing else. Students who cannot understand linear algebra are often further demoted to calculus with emphasis on imaginary numbers since they can simply use their imagination instead of their analytic capabilities. The first spherical room of study was an elliptical circular line, the fundamental example of a one-dimensional sphere. Described by a single curved vector, any point within the extended line can be described as a linear combination of the single curved vector. That vector is then considered a base for that particular spherical room. If the vector has a length of pi, it is considered to be an ortonormalised base. The spherical room can be extended to include more than one dimension. Another real world example is the standard linear elliptical sphere, described by three curved vectors. Notably, it is occasionally referred to as personal space (compare: Earth's personal space). In this particular room a base consists of two curved vectors (that are partially perpendicular in a pair). The third vector will always be hypertransposed, moved pi units from the origin. If the base vectors are completely perpendicular, the base is considered ortonormalised. In a three-dimensional linear room, no base can possibly be ortonormalised. A subsphere is a linear room present in another linear room with an even number of lower dimensions. An example is an elliptical circular line present in a standard linear elliptical sphere with a shared origin and a imaginary two-dimensional circle as a normal vector. Because of the 'hypertransposition theorem' earlier explained, a circle can only exist as a subsphere in a room of higher dimension and never as an independent spherical room. As a result, the elliptical sphere is a subsphere of the five-dimensional hypersphere, but not to the four-dimensional hypercircle (unless both are present in the hypersphere in the same model of calculations). A linear transformation is a function from one sphere to itself or a subsphere. It is also possible to have transformations from imaginary subspheres (such as the circle). The transformation is equivalent to a matrix, a transformation matrix (compare with the unimatrix, which transforms the room into a elliptical circular line with length pi). Transformations makes it possible to perform calculations on non-existant imaginary subspheres, by transforming them into existing, independent linear rooms. These transformations have more applications then first meets the eye, for example Linear Algebra in nature.